You can’t buy any of the Adobe Creative Suite products anymore. From now on you can only “license” any of Adobe’s products for a monthly or annual fee. This includes Photoshop, Premiere, Dreamweaver and all the other CS products we know and love. That’s old news. What isn’t so old is the bitching and bickering from everybody (including myself) about the idea of being “forced” to shill out small regular payments and pay for “access and incremental upgrades”, rather than “invest big” once and own the software. While this is certainly a departure from the old licensing model, I wonder: is it really worth losing sleep over it? Let’s examine the options and see if perhaps a monthly subscription is actually cheaper than purchasing a product the old fashioned way. Let’s start by looking at my current situation with Photoshop. I’ve bought CS3 for PC many years ago. I remember it well, my first ever legal version for PC. Having had many previous cracked versions, I was only a hobbyist then so a big investment wouldn’t have made sense (besides I was lacking the cash). But when CS3 was current I was starting to make money with my images and thought an investment into the latest version was called for. It felt good! Photoshop CS3 was about £500 if I recall. It came in a groovy recycled box too, and I loved the feeling of finally being “decent” as well as current. That was back in 2007. Fast forward several years, by which time I’m a Mac user with the need for native version of Photoshop. It wasn’t the feature set that made me decide to upgrade. Had it been possible, I would still be running CS3 – and believe me I’ve tried using the PC version in an emulator on my Mac. It works, but it’s not as slick as I wanted it to be. So I bought Photoshop CS5 for Mac in 2011. This was an upgrade, which was substantially cheaper than the full version. I think it set me back about £250 if memory serves me right. It was slightly annoying to bite the bullet again, but I’m very happy I made the jump. There were a few new features I could have lived without, but it was nice to get them thrown in (like the Mixer Brush and 64bit processing). By my calculations this was total spend of £750 in 5 years. That’s £150 per year, or £12.50 per month. Now it’s 2013, and I’m yet again looking into upgrading Photoshop – this time for a possible additional feature set that may or may not be beneficial to me: the 3D tools. I’m currently evaluating if the “extended features” of Photoshop would be beneficial to me. Option 2 will also have a price increase to $20 after the first year. I’m getting a discount because I already own qualifying products – if I sign up before the end of August. New features and added “cloud storage” aside, option 2 is a bit easier on my cash flow and would set me back pretty much the same amount as option 1 over the course of the nest two and a half years, say until 2015. Option 1 means I own my copy for ever and a day, and I don’t need to “check in” with Adobe once a month. And if I don’t want to upgrade again, I could potentially use my copy many years after 2015 if the operating system allows. So if I’d travel to Mars for 20+ years, I could still photoshop my pictures while I’m cruising deep space – even without an internet connection. That’s great. But right now I’m not thinking of going there. Looking at my upgrade history, in 2015 it is very likely that another need arises which will make me look at upgrading Photoshop once again. So really in regards to “one option is cheaper than the other”, I can honestly say they both cost the same. Option 2 however does this by spreading out the cost a bit. CS6 vs CC = Deuce. 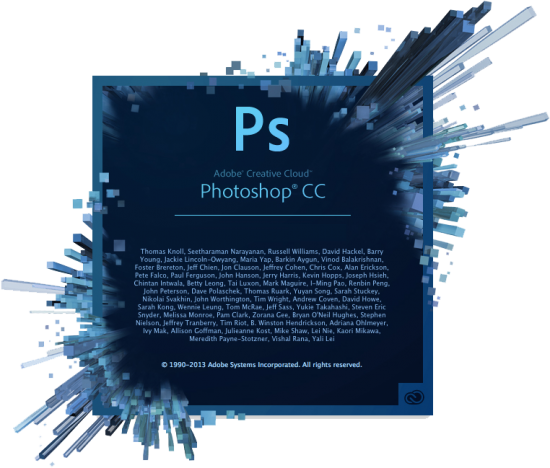 With Photoshop CC we also get this super swishy splash screen. Worth every penny! I love the fact that I can still use my old copy of Photoshop CS3 on today’s PCs. Like my Surface Pro for example. It works just fine – even though the cursor looks a little wonky at times. But I can also see a point at which this may not be possible anymore. Who’s to say that my software – without any patches coming from Adobe – will work on hardware/software in 5 years time? As we know old software does not receive patches, new software does. There is hence a risk of not being able to use the software you own today when a new OS comes along. The Creative Cloud subscription allows me access to both Mac and Windows versions, and I can install those on more than one machine. I’m not sure what would happen if I’d try to use both at the same time. The price argument is slightly different when you’re using more than one Adobe app. In which case you’d either pay $20 per month per app, or you sign up for $50 a month and get access to ALL of Adobe’s Creative Suite applications. If you’re using 2-3 apps and only occasionally then this sounds a bit expensive. It’s the equivalent of $600 per year every year. Aside from Photoshop, I also use Dreamweaver, Lightroom and Premiere – the latter two much less regularly. Yet I still need them, but there’s really no need to upgrade any of them for me. But if I was a full Creative Suite user, if I was using Illustrator and Audition, and if I would need Edge and Muse, then $50 a month would be a sweet deal for me – considering Creative Suite users would have spent well over $2000 for an all-round upgrade every year. My guess is that the majority of individuals are like me and use less than a handful of apps though. This will be different for companies of course. Did you know than prior to Creative Cloud, Adobe’s apps were much cheaper in the US and in other parts of the world? For Australians it used to be cheaper to fly over to the US and buy a copy of the Master Collection abroad than to order it locally! The subscription prices to Creative Cloud may level the playing field a bit. Maybe. I’m still divided about the “subscription only” policy. And that’s not because of price. I think that’ll be more or less the same. I’m reacting to something I’d like to call the “New Coke” problem: the fact that users don’t have a choice in this matter. Would it kill Adobe to market two versions of the same product, just to keep us mortals happy? Then the people could decide what they’d like to go with. Right now we’re being told “This is the new way of Photoshop. Deal with it and shut up”. Loyal users do not and will not and cannot react kindly to that kind of attitude. What’s clearly missing here is Adobe acknowledging the human component in this business deal. It’s like saying “This new flavour of Coke is clearly better – and we don’t care what you think, we’ve made the decision for you and will stop making what you’ve been drinking for years”. Sure, the Cloud Thing tastes a bit nicer. Sure, we’re getting more features. But it’s not us saying “we chose this product over another”, it’s an evil dictator who makes the decision for us. That’s the problem. I don’t even think that Adobe don’t care. I believe they just didn’t think their customers are humans. To Adobe, we’re numbers on a spreadsheet – and the higher the graph goes, the better it is for Adobe. We’re not seen creative humans with opinions and tantrums. And having this message shoved down our throats is… well… painful.